Series V1024 is the ideal solution where a fixed frame shelter is not feasible and a variety of different height and width trailers are serviced. Series V1024 is designed to provide complete access to the trailer openings. Perfect for problem dock areas such a sloped and difficult driveway approaches. Great for installation on metal siding building walls. Super Seal’s exclusive 16 oz. 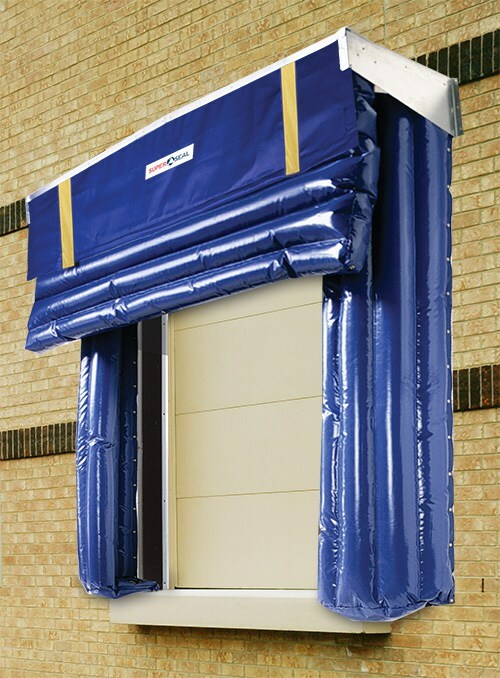 “Rip Stop” fabric was developed specifically for inflatable products and will give years of hassle free service. Series V1024 standard dimensions for door openings 10′ wide X 10′ high are 11’4” wide X 11’8” high (O.D.) with a 24” projection, and a 48” header air bag when inflated. The V1024 seals trailers 10’6” to 13’6” high from grade with a dock height of 48”. Series V1024 Retractable inflatable truck shelter consists of two vertical air bags to be fastened onto a 2” x 8” select kiln-dried pressurized wood frame, through brass plated grommets using galvanized wood screws which is provided unassembled by the manufacturer. The bottom of the vertical seals are to have an inflatable bottom corner seal which will include brass plated grommets for venting of air and to assist in moisture drainage. Inflatable header air bag to be full width over vertical seals mounted on a select kiln-dried pressurized wood frame. Inflatable header air bag in deflated mode is stored behind a reinforced vinyl curtain with a 4” yellow stripe to aid in the spotting of trailers. The V1024 is inflated by turning switch on and deflates automatically when unit is turned off by an internal pulley and retraction arm system for the verticals and a torsion roller assembly for the header. The motor/blower is mounted under a protective canopy constructed of cedar framework covered with UV treated translucent rigid plastic. The top canopy is peaked to allow for drainage and is to be fastened to the wall using a galvanized steel side and strapping supports.